What is the Mano a Mano Ministry Team? This ministry team supports the work of Mano a Mano International Partners, a non-profit organization founded in 1994 by Segundo and Joan Velasquez, long-time members of Unity Church-Unitarian. The inauguration of a Mano a Mano-built school is cause for village parades, speeches and celebration. ​What Is Mano a Mano International Partners? Mano a Mano International Partners is dedicated to building infrastructure for health care, education, transportation and economic development in rural Bolivia. Mano a Mano works in bilateral partnership with four Bolivian counterpart organizations: Mano a Mano-Bolivia with its focus on health and education; Mano a Mano Nuevo Mundo which builds roads and water projects; Apoyo Aereo, providing air transport and air rescue to remote areas; and Mano a Mano Internacional which hosts visitors and pilots new projects such as its Center for Ecological Agriculture (CEA). Through these partnerships, Mano a Mano has built a network of over 170 community health clinics as well as more than 60 schools with on-site housing for teachers. Mano a Mano has constructed hundreds of kilometers of roads to connect remote villages with larger towns and services. Mano a Mano’s water projects support food security for subsistence farmers in the high Andes, while the organization’s Center for Ecological Agriculture trains farmers in sustainable agricultural practices. Rural Bolivian children have high rates of illness and mortality; primary care clinics built by Mano a Mano allow Bolivian health care providers to improve health in remote areas of the country. How does the Team support Mano a Mano? Are you interested in traveling to Bolivia? Nearly 150 Unity members have traveled to Bolivia to observe the work of Mano a Mano’s partner organizations. Annual group trips in March and June are coordinated by team members.. On a typical trip, travelers tour clinics in remote rural areas; see roads that Mano a Mano has carved into mountainsides; and visit water reservoirs that help farm families attain food security and increase their subsistence-level incomes. Visits to the CEA are a highlight of most trips. The Ministry Team is a welcoming group with a social justice focus. It is chaired in rotation by team members and meets monthly except during the summer. Members also spend social time together, organizing a summer picnic and winter holiday party every year. To learn more about the Mano a Mano Outreach Ministry Team, contact Lisa Friedman, Unity’s Minister of Congregational and Community Engagement, lisa@unityunitarian.org or 651-228-1456 x107, or Lori Wedeking, l_wedeking@msn.com. For more about Mano a Mano International Partners, visit www.manoamano.org. 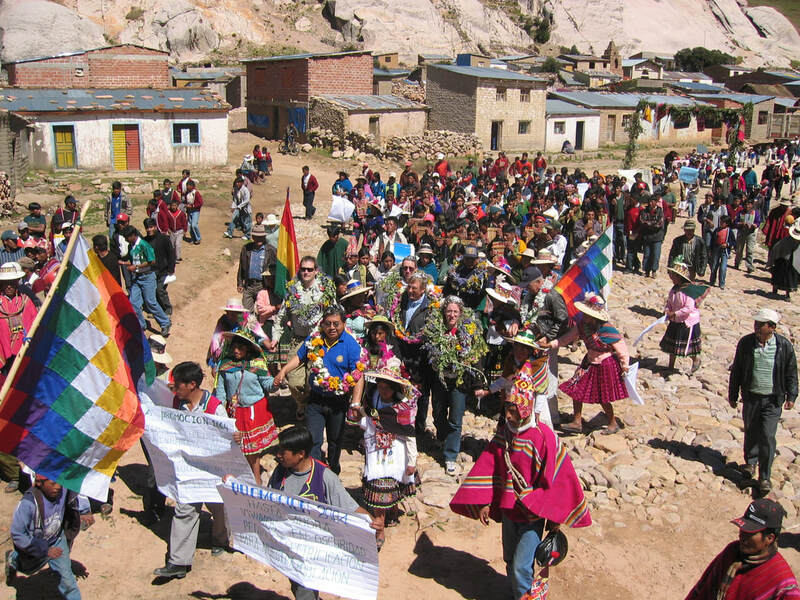 Foreign visitors to Bolivian village celebrations are uniformly treated with great kindness and hospitality, wreathed and showered with confetti.